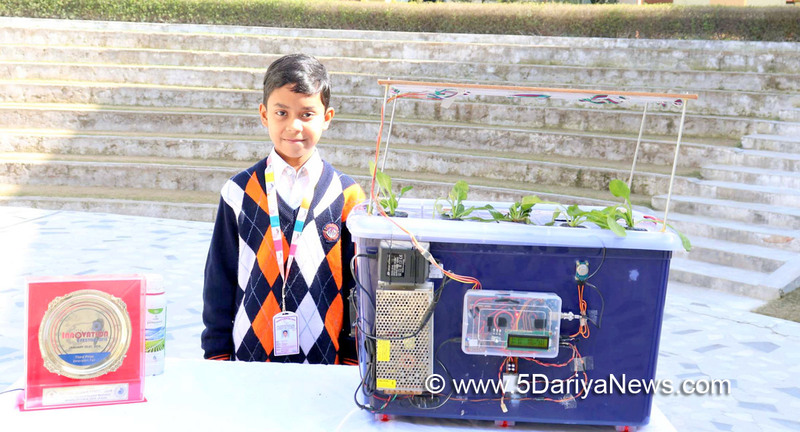 Arjun Jain of 7th Grade from Oakridge International School along with his other 4 friends made growing plants without soil possible. Their innovations, Vedaponics. The Mist maker received the third prize at the Innovation Fair that help grow plant without soil. National Innovation fair held at Delhi, witnessed many remarkable innovations those who go above and beyond their roles in higher education, and was hosted by National Science Center. An innovation for the nature however, caught everyone's attention at the Fair.This mist maker can be used to grow plants in small areas like kitchen garden to rooftops, and from barren lands to even in space. This innovation grow plant with aeroponics techniques. It’s a process of growing plants in an air or mist environment without the use of soil. Arduino sensor, humidity sensor, temp and CO2 sensor are some of the principal instruments that has been used to successfully accomplish the project. Once the humidity level decreases, these sensors sends a signal to the system when the mist maker plays its role by spraying nutrients on plants. The nutrients are organic and has been taken from our ‘Vedas’ such as Panchagavya, a cow dung based mixture and kunapajala. It is, therefore, named as Vedaponics. Since the environmental conditions are very much controlled, it helps us to get rid of all the soil prone diseases.Ramanjit Ghuman , Principal, Oakridge International School, said that I am happy to see young student like Arjun showcased critical thinking and problem solving skills along with the application of knowledge. These are the requirements for the 21st century and the school firmly believes and works towards nurturing these skills.